Follow these easy instructions for preparing a ledger wallCarefully consider where you want your new wall to be. Sort the stones into three or four piles, according to size. That will make it easier to find the size stones you will need. Reserve plenty of large stones to use for the wall cap�s. Dig a trench and lay the first stones. Remove sod and all other organic material from an area about 3 inches wider than the desired bottom thickness of the wall. Check with a straightedge to see that the excavation is fairly flat. Lay a tie stone at either end. Fill space between the outside stones with tightly packed stones. As you continue to lay stones, aim to make the courses fairly level. 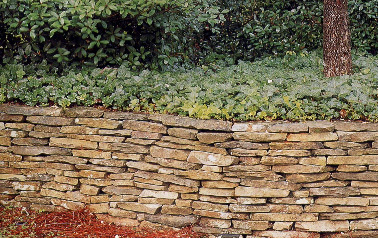 Whenever possible, lay �one on top of two� rather than stacking stones of the same size directly on top of each other. Make sure that the wall leans inward slightly. Every third or fourth course, install tie stones every 2 or 3 feet. Fill any large gaps by gently tapping in small stones.